This Child Care Salary Sacrifice Benefit Calculator aims to help Australia families to decide whether they should choose Government Child Care Benefit or the Salary Sacrifice benefit from their employer. (2) if you cannot receive any Child Care Benefit, should you choose salary sacrifice provided by your employer OR to receive Government Child Care Rebate. 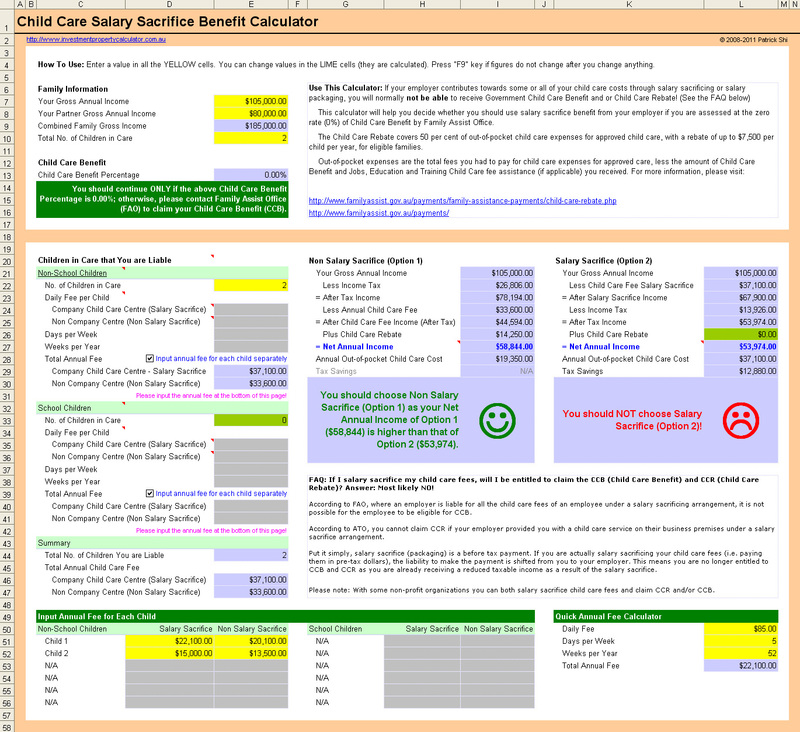 The Child Care Salary Sacrifice Benefit Calculator can estimate different scenarios. For example, when you have two children attending the same daycare on the same days with the same daily payments. Or, you have multiple children (up to 6) and they attend the daycare for different number of days and/or weeks and their daily fees are different (as shown in the Multiple Kids & Different Fees screen shots). 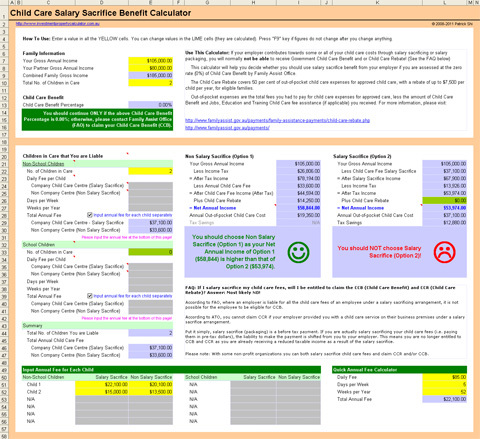 Here is a screen shot that will give you a better idea that what you need to do and what this free Child Care Salary Sacrifice Benefit calculator can tell you. This calculator is built in Microsoft Excel worksheet. You need to have Microsoft Excel 2000-2013 and Microsoft Windows to use it. You may be able to use the calculator with other applications that can open and read XLS spreadsheets, but this has not been tested. If your employer contributes towards some or all of your child care costs through salary sacrificing or salary packaging, you will normally not be able to receive Government Child Care Benefit and or Child Care Rebate! According to FAO, where an employer is liable for all the child care fees of an employee under a salary sacrificing arrangement, it is not possible for the employee to be eligible for CCB. According to ATO, you cannot claim CCR if your employer provided you with a child care service on their business premises under a salary sacrifice arrangement. Put it simply, salary sacrifice (packaging) is a before tax payment. If you are actually salary sacrificing your child care fees (i.e. paying them in pre-tax dollars), the liability to make the payment is shifted from you to your employer. This means you are no longer entitled to CCB and CCR as you are already receiving a reduced taxable income as a result of the salary sacrifice. Please note: With some non-profit organizations you can both salary sacrifice child care fees and claim CCR and/or CCB. The Child Care Rebate covers 50 per cent of out-of-pocket child care expenses for approved child care, with a rebate of up to $7,500 (indexed) per child per year, for eligible families. Out-of-pocket expenses are the total fees you had to pay for child care expenses for approved care, less the amount of Child Care Benefit and Jobs, Education and Training Child Care fee assistance (if applicable) you received. 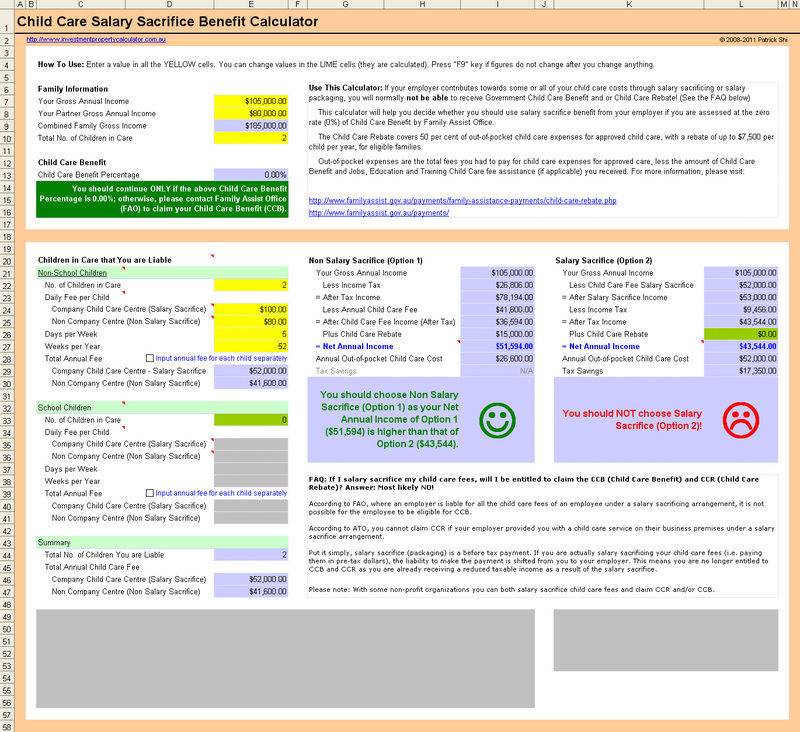 Download FREE Child Care Salary Sacrifice Benefit Calculator Now!